The bride's vision of her fairytale princess wedding came true at the Capella Di Amore wedding chapel at Hilton Lake Las Vegas Resort. Soft pink colors mixed with Tiffany blue was their color theme. 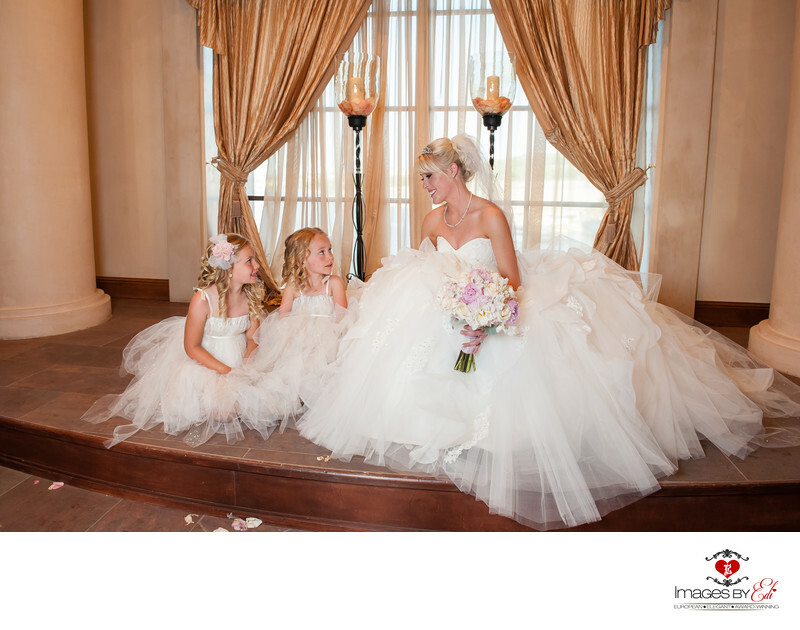 This image captures the bride with the little flower girls having an intimate moment at the Capella Di Amore wedding chapel, during their portrait session after their Hilton Lake Las Vegas Resort wedding ceremony. The bride is wearing a princess wedding dress. The flowers and decoration was done by the talented Petals Flowers and Events. Keywords: Bride with flower girls (3), Hilton Lake Las Vegas Wedding Photographer (33), Hilton Lake Las Vegas Wedding Photography (33), Images by EDI (300), Las Vegas Wedding Photographer (624), Las Vegas Wedding Photography (642).